I'm out of words. I cried. I couldn't put it down. And while the ending wasn't ALL I was hoping for, it certainly led in the right direction and left me with a feeling of cathartic euphoria that still pops up to say hello every time I talk about this series. Read it. Start with Wool, then Shift, and finish off with Dust. You just have to experience this to understand. 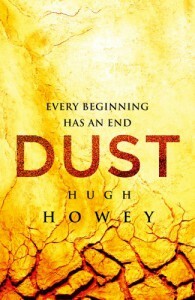 Hugh Howey is my new best friend. Why? Well, certainly not because he write a thoughtful reply to the email I sent him in my out-of-character (for me) fangirl moment a few months ago. No, he didn’t personally respond to the email, but he did have an extremely hilarious auto-response email set up for any and all who would like to shoot him an email (I’m not officially encouraging this, but the automatic reply is pretty darn funny!). No, he is my new best friend because he came into my life as a result of one comment, and nothing has been the same since. Now, he may or may not actually be aware that he is my new best friend (I’m guessing not unless he reads this review), but he has made a huge impact on me as a reader, as a writer, and as a human being. I took a chance and purchased the Omnibus version of Wool (the first book in the Silo saga) because of a comment in a review for my book. Someone stated that my book reminded them a little (in certain ways) of his book. This got my attention, as I had never heard of it before. Therefore, I bought it and began reading what would become what one might call “my life” for days thereafter. I devoured this story of humanity at a threshold, of human perseverance tested beyond its limits, of the simple act of human kindness in a world where people need it most. I’m not going to lie. I cried. I cried buckets throughout the entire series as I read all three books back-to-back. I haven’t been this excited about a book in years. His story touched me in a way I can’t explain. My husband is currently reading them (he’s reading Shift now, the second book in the saga) because I pestered him to death about reading them. I couldn’t explain why. I just needed to be able to discuss these books with someone I know. I knew he’d be just as captivated as I was, but I dread the moments when he hits a sad part and gives me that look that says, “Why am I reading this, again?” But the highs and lows of Howey’s book are all part of the experience. And it is an experience. Something that seems so insignificant or fleeting will later become the crux for a major plot development. Yeah. I noticed a little while back that some people had rated it low because they were disappointed in the science fiction label, which they felt was inaccurate. I can understand their frustration because if you are looking for hard sci-fi, this is not it. This is a dystopian world built within a science fiction setting in order to portray a story that transcends all genres (I know I sound like his publicist or something, but I swear I’m merely a lowly fan). I think the reason this upsets people is that the fans of traditional sci-fi are looking for a story built around an intricate science fiction setting as opposed to what Howey offers us: a sci-fi setting built around an intricate story. That isn't to say that science fiction can’t have intricate stories. I love all forms of speculative fiction from fantasy to sci-fi, but you need to come to this book with the understanding that he didn't write a science fiction novel. He wrote a story about people who just happen to live in a dystopian world. The message, as opposed to the world around the characters, is key. As a side note, I've read a little of his more "hard" science fiction (which many seem to like and has won awards), but I wasn't really into it. Another novel of his, Sand, is very similar to the Silo series in style. I truly enjoyed it and look forward to the sequel-in-progress. But I digress. This book resonated with me so strongly that it has taken me months to write this review. I feel like I can’t do it justice. I tell my friends and family to read it. I can’t say enough good things about the entire series (Wool, Shift, and Dust). I can't really say anything at all without giving away too much. But if you are willing to take a chance here on something new and different, you can find something you love no matter your normal genre of reading. This series isn't for "science fiction" readers; it's for humankind. I usually try to keep a balanced review and point out something that I felt detracted from the story. But you know what? Any issues I came across must have been trivial because I can’t even remember them.